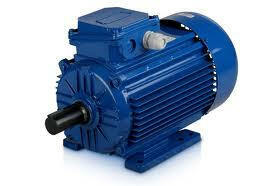 An AC motor is an electric motor driven by an alternating current. It commonly consists of two basic parts, an outside stationary stator having coils supplied with alternating current to produce a rotating magnetic field, and an inside rotor attached to the output shaft that is given a torque by the rotating field. Where speed stability is important, some AC motors (such as some Papst motors) have the stator on the inside and the rotor on the outside to optimize inertia and cooling. There are two main types of AC motors, depending on the type of rotor used. The first type is the induction motor, which only runs slightly slower or faster than the supply frequency. The magnetic field on the rotor of this motor is created by an induced current. The second type is the synchronous motor, which does not rely on induction and as a result, can rotate exactly at the supply frequency or a sub-multiple of the supply frequency. The magnetic field on the rotor is either generated by current delivered through slip rings or by a permanent magnet. Other types of motors include eddy current motors, and also AC/DC mechanically-commutated machines in which speed is dependent on voltage and winding connection. Most common AC motors use the squirrel cage rotor, which will be found in virtually all domestic and light industrial alternating current motors. The squirrel cage refers to the rotating exercise cage for pet animals. The motor takes its name from the shape of its rotor "windings"- a ring at either end of the rotor, with bars connecting the rings running the length of the rotor. It is typically cast aluminum or copper poured between the iron laminates of the rotor, and usually only the end rings will be visible. The vast majority of the rotor currents will flow through the bars rather than the higher-resistance and usually varnished laminates. Very low voltages at very high currents are typical in the bars and end rings; high efficiency motors will often use cast copper to reduce the resistance in the rotor. In operation, the squirrel cage motor may be viewed as a transformer with a rotating secondary. When the rotor is not rotating in sync with the magnetic field, large rotor currents are induced; the large rotor currents magnetize the rotor and interact with the stator's magnetic fields to bring the rotor almost into synchronization with the stator's field. An unloaded squirrel cage motor at rated no-load speed will consume electrical power only to maintain rotor speed against friction and resistance losses. As the mechanical load increases, so will the electrical load - the electrical load is inherently related to the mechanical load. This is similar to a transformer, where the primary's electrical load is related to the secondary's electrical load. This is why a squirrel cage blower motor may cause household lights to dim upon starting, but does not dim the lights on startup when its fan belt (and therefore mechanical load) is removed. Furthermore, a stalled squirrel cage motor (overloaded or with a jammed shaft) will consume current limited only by circuit resistance as it attempts to start. Unless something else limits the current (or cuts it off completely) overheating and destruction of the winding insulation is the likely outcome. To prevent the currents induced in the squirrel cage from superimposing itself back onto the supply, the squirrel cage is generally constructed with a prime number of bars, or at least a small multiple of a prime number (rarely more than 2). There is an optimum number of bars in any design, and increasing the number of bars beyond that point merely serves to increase the losses of the motor particularly when starting. Motor AC yang dibicarakan disini adalah motor yang digerakkan dengan sumber tegangan AC tiga fase. Motor AC 3 fase ada yang menyebut juga dengan motor asinkron ini terdiri dari bagian yang diam yaitu stator berupa medan magnet yang berputar (biasanya dibuat dari lilitan kawat) dan bagian yang bergerak putar yaitu motor. Penjelasan name plate motor AC tersebut adalah: motor AC 4 pole, dayanya 10 HP atau 7,5Kw, frekuensi jala-jala 50 Hz, kecepatan putar 1450 RPM. Untuk operasional kerja motor jenis DELTA dibutuhkan sumber tegangan 380V dengan arus 16,2A sedangakan koneksi kelistrikan seperti terlihat pada skema hubungan (U1-W2), (V1-U2), (w1-V2). Sedangkan jika dioperasikan model STAR maka dibutuhkan tegangan 415V dan arus 14,9A serta koneksi terminal (W2-U2-V2), (U1-V1-W1).